Pili Gyasi registered over 140 students for the midterm elections. Founded two years ago as a non-profit civic engagement organization by Cristina Tzintzun Ramirez, Jolt Texas has given the Latinx population a reason to vote this November. The Texas based organization has multiple chapters throughout the state with the mission to collectively build the voice, power and influence of Latinx communities. Jolt Texas registered over 5,000 voters across Texas. Travis County’s voter registration rate is 92 percent, but only 25 percent of those registered actually voted during the mid-term cycle. 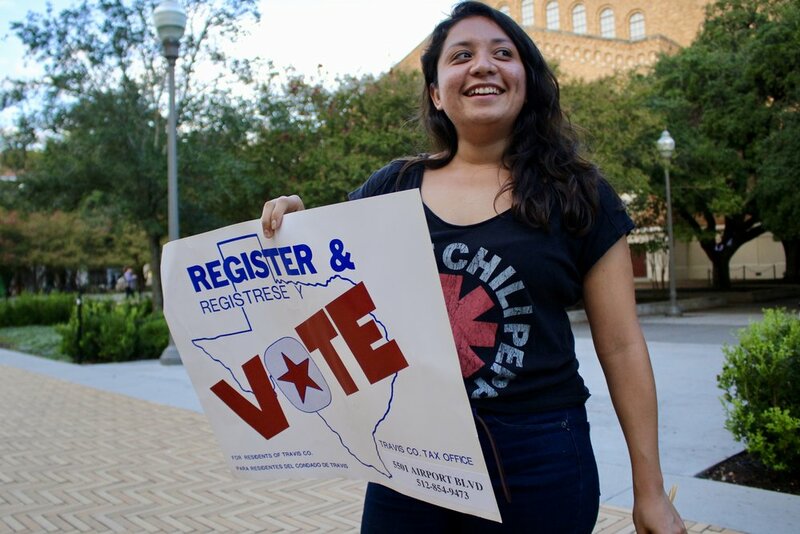 With a strong focus on turning out the young Latinx vote, Jolt’s University of Texas at Austin chapter has registered about 600 voters since the beginning of the fall semester. One of their tactics includes reaching out to high school teachers and asking to register their newly 18-year-old students. Jolt’s continued goal is to win the dignity and respect the Latinx community deserves, especially as the largest minority group in Texas with an estimated population of 10.8 million. Gyasi, Patillo, and Villanueva registering voters on campus. Grassroots organizing involves much of the nitty gritty details that are often overlooked. Entering data onto a spreadsheet, registering voters and organizing special events only scratches the surface of what is accomplished, Garza says. Gabriela Garza, Jolt UT chapter president, stands in solidarity with students at the “Stand with Survivors” rally on Tuesday, Oct. 9.